Demand for good length clean white crossbred wool is strengthening. Photo – Arcadian Wool Brokers. CROSSBRED wools bound for the fake fur and knitwear trade in China reached record price levels at auctions this week, although the industry’s benchmark indicator slipped lower. AWEX senior market analyst Lionel Plunkett said the Eastern Market Indicator fell for the seventh consecutive week, after losing 7 cents this week to close at 1936c/kg clean, for an ever-increasing selection of lower yielding and lesser style wools. The EMI in $US lifted four cents to US1387c/kg clean, as the $A-US dollar exchange rate lifted 0.45 cents to US71.63 cents. Mr Plunkett said the EMI has not fallen for seven successive weeks since November 2003, but despite the long run of losses, the EMI is still 57 cents above where it was at the beginning of the year. However, he said crossbred wools continue to defy the overall trend of the market, recording gains again this week. The 25-30 micron fleece lines offered generally rose by 20 to 30 cents, he said. “The Micron Price Guide for 28 micron reached a new record in the south on the back of these rises. The Micron Price Guides for 25 micron wool rose by 27 cents to 1655c/kg in Melbourne this week, and other major rises included 65 cents to 1268c/kg for 28 micron, 35 cents to 998c/kg for 30 micron, and 23 cents to 659c/kg for 32 micron. Australian Wool Innovation trade consultant Scott Carmody said most of the increase in crossbred wool prices has come from the fake fur sector competing with the established knitwear and coating trade that manufactures broader wool sweaters and coats. There is also demand for crossbreds to blend with finer wools. He said crossbred wool growers in New South Wales are looking at shearing earlier. “So we are getting a lot of short prem wools, with a little bit of a lack of longer-fibred crossbred wool. Mr Carmody said crossbred wool from composite sheep is not as well sought after as fleece from first cross, Corriedale and some second cross sheep. “What is being sought is our good white crossbred wool, because a lot of other regions of the world only grow composite-type wool. Mr Plunkett said as brokers are reporting a sharp decline in shearing activity, the national offering declined by 73 bales to 37,527 bales and brokers passed in 10 percent. “Although the overall quantity only slightly decreased, the weekly offering in the north was the smallest sale since AWEX began — since 1995. Mr Plunkett said the Western Region Indicator does not include crossbred types, which explains why it recorded more substantial losses than in the east this week. 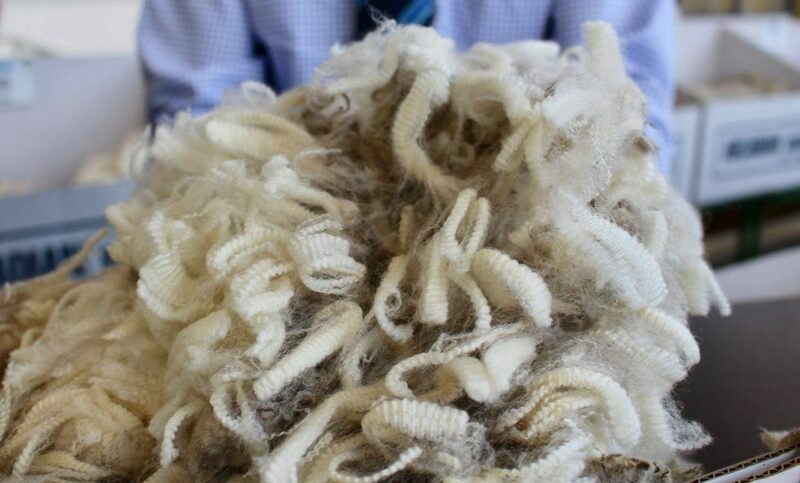 Australian Wool Innovation’s weekly market report said the strengthening Australian dollar was a factor in the diminishing prices of the Merino sector, but the quality of the offering, or rather the lack of quality, is the primary cause of the slowly degrading price levels. “Broker sales catalogues are increasingly dominated by Merino fleece clips that are very low in yield (less than 60pc) and very weak staple strength (less than 25Newtons per kilotex). “With such readings these wools are priced by sale room operators towards the knitting types rather than worsted apparel that almost always command the best prices in the market and the manufacturing category that Merino fleece is generally destined for. Prices this week once again mirrored the activity of the past few months,” AWI said. “The price decay has been very slow and methodical and this week was no exception. “Sydney had a low quantity on offer, with just under 4000 bales of Merino fleece available, so small falls of just 5 cents were recorded,” AWI said. “In fact, AWEX reported the Sydney sale as having the smallest ever volume on offer since they commenced in 1994. “In Fremantle and Melbourne though, their respective volumes of Merino fleece of around 8000 and 11,000 bales saw prices retreat in the range of 15 to 35 cents, with most losses centred at the upper level of those numbers,” AWI said. AWI said all sale centres reported that the small percentage of the selection that fit the “better” type category sold to a much better tone and in places actually increased. “Buyers are needing these better specifications to average the lower types into their orders. AWI said superfine spinners and best top-making types are now almost non-existent in the weekly offerings. Next week, the bale offering is currently 42,487 bales in Sydney, Melbourne and Fremantle. Due to the Good Friday public holiday, sales will be held on Tuesday and Wednesday.